« Check email less, reduce your stress? 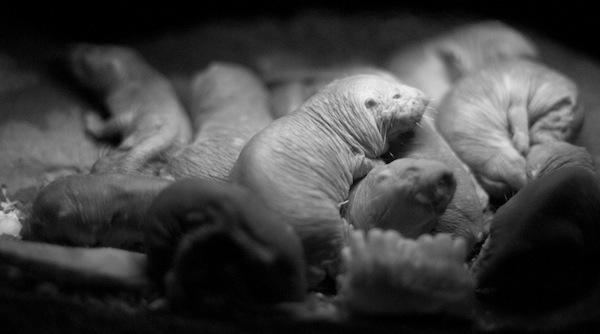 Naked mole rats — is there anything they can’t do? These wrinkly little critters live up to 30 years, more than ten times as long as other rodents their size. They are essentially immune to cancer (a fact which makes them of great interest to the medical community) and also apparently insensitive to some kinds of pain. Last, but certainly not least, they are able to survive at levels of oxygen so low that they would be fatal to other animals. 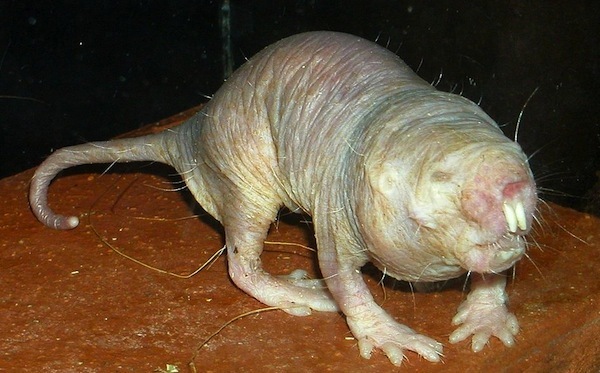 This week, researchers at the University of British Columbia showed that naked mole rats do this in a way that is completely unique among mammals. The insight may one day lead to new ways to prevent or treat human conditions like stroke. Pamenter has already had some success in identifying certain biochemical mechanisms that seem to be involved in preventing brain damage during exposure to low oxygen, at least in turtles. But turtles are reptiles, and while the molecules found in their brains are similar to those found in humans, the way they interact with each other can be different. A better analogue for humans would be another mammal. Like, say, a naked mole rat. Pamenter first began working with naked mole rats (or NMRs, as scientists in the know call them) about a year and a half ago. “They get a lot of attention for being very ugly, but behaviourally they’re quite cute,” he says. “They’re always active, running around, constantly digging and working and bumping into each other.” In their native East Africa, NMRs live in colonies, much like bees, termites or ants. There’s a queen — a large female who will have up to 900 babies in her lifetime — a few males who mate with her, and several dozen workers. These may be diggers who build new tunnels and find delicious tubers to eat, nurses who look after young, or soldiers who defend the colony from predators like snakes. With all of these bodies running around in tiny tunnels about a metre below the surface, oxygen can get used up quickly. Our atmosphere is about 21 per cent oxygen; in an NMR tunnel it’s typically 14 per cent or lower. In such conditions, humans can’t survive long without bringing their own oxygen supply. (For example, on Mount Everest, the oxygen concentration is still about 21 per cent, but the atmospheric pressure drops to about a third of that at ground level. Thus, it can feel like you’re breathing only 7 per cent oxygen.) For the NMRs though, it’s no sweat. Previous studies have shown O2 levels can drop to a mere 3 per cent and the intrepid little rodents just keep on keepin’ on. In order to gauge what the NMRs are doing to survive these levels, Pamenter and his colleagues placed them in a chamber that can measure how much air they breathe and how quickly they use up the oxygen available to them. Similar measurements are used in sports clinics to determine our metabolic rate, i.e. how quickly we burn energy, when resting or exercising. In a paper published this week in Proceedings of the Royal Society B, the team showed that under an atmosphere of 7 per cent oxygen, the NMRs slowed their breathing down to about a third of what it would normally be. They also used about one third the amount of oxygen, which meant that their metabolic rate had slowed too. So how are they doing it? We have no idea. One theory is that NMRs may have unique adaptations in their mitochondria, the tiny energy factories that exist within every cell. NMR mitochondria may simply be able to get more energy out of every O2 molecule they burn up. It’s also possible that NMRs might be able to shut down certain tissues one at a time; they may keep their brains, nerves and muscles firing, but slow down their digestive system or reproduction to make up for it. But the holy grail would be some sort of substance produced in the NMR body that protects cells and tissues from the damaging effects of low oxygen. If it exists, humans might be able to make a synthetic version that could protect our own tissues from damage during a stroke. Great stuff Tyler. Keep ’em coming. I look forward to seeing all your mindexpanding articles. The potential applications for this area of research are staggering. And all right there beneath our noses (if not our feet), well, if we were in East Africa anyway.